Currently there are trains operating in eight of Canada’s ten provinces. 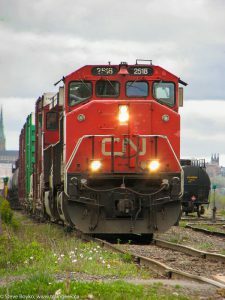 There are two major Canadian railways, CN and CP, and several American railways operate into Canada from the United States. Canada also has numerous shortline railways operating in different provinces. Canada’s national passenger railway service VIA Rail operates from the Atlantic to the Pacific oceans, in a corridor from Quebec City to Toronto, and to several remote locations.